There are lots of ways to maximize square footage in a small space. But one of our favorite space-saving ideas is the loft bed. Contemporary models are a far cry from the clunky wooden structures you had in your dorm room. For instance, "Urban" by The Living Cub is a mighty good looking solution that packs an almost unbelievable amount of storage room. The unit features a queen-sized bed, a spot to hang a 42" flat screen TV, and a modular storage wall for clothing, shoes, and books. And here's the kicker, inside you'll find a teeny room that makes a handy walk-in closet or even a compact home office. To learn more or to order, visit LivingCube. If you’re thinking about building a lofted sleeping area, you’ll find this idea that maximizes vertical space inspiring. The Harpoon House is a 704-square-foot home in Portland, Oregon with a custom built sleeping loft that doubles as a home office. The problem with small open living spaces (think studio apartments) is the lack of separation between your living area, kitchen, and bedroom. Jordan Parnasse Digital Architecture came up with a solution for this dilemma when he designed the queen-sized loft bed shown here for a 461-square-foot studio in New York City. Here's how it works -- The loft bed doubles as a room divider and storage unit, but there's no clunky ladder because the shelves also function as stairs. 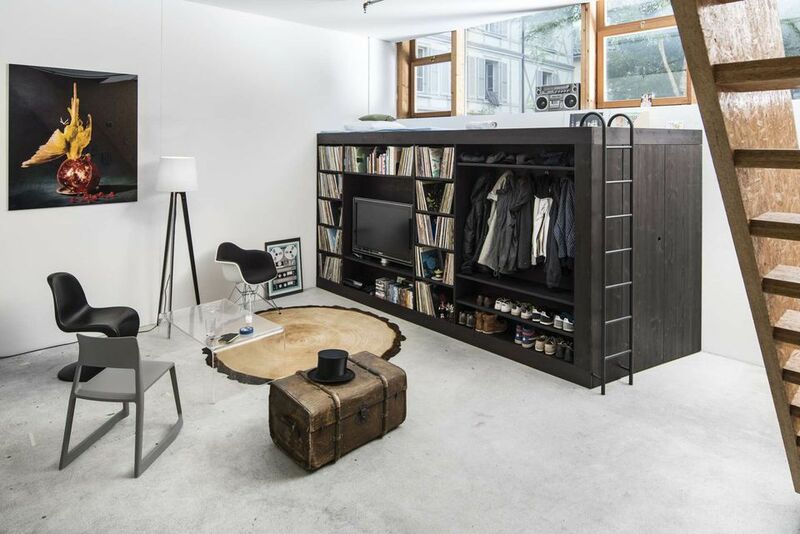 This London apartment has a loft bed with a lofty outlook. There's a retractable skylight directly above that opens up to a view of the stars or gorgeous sunshine. Stairs with storage is a typical loft bed feature, but this sleeping nook, designed by Jordan Parnasse Digital Architecture conceals compartments for storage. Also, next to the bed is a built-in night table and wall cabinetry. What’s underneath? A walk-in closet.